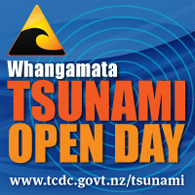 The open days provide you with an opportunity to learn more about what we understand to be the Tsunami threat to the settlements of Whangamata. The Coastal and Tsunami scientists that have worked on this project will be in attendance at the open days to provide the opportunity for you to talk with them directly. The open days are also an invitation to you to make comment on what you think should be the approach to managing the tsunami risk. What you think about coastal land use planning such as restricting the location of facilities such as kindergartens or rest-homes being built in potential tsunami inundation paths. For more information about this project and the Eastern Coromandel Tsunami Strategy visit the WhangamataTsunami Project page. OPOUTERE IS NOT IDENTIFIED IN THIS PLAN, PLEASE ATTEND IF YOU CAN AND ENSURE OPOUTERE IS INCLUDED.